We believe that there is a significant need for peer support in populations of adolescents and young adults who live with chronic illnesses and undergo frequent or lengthy hospitalizations. While we see this need in the lives of the many patients we get to meet in Streetlight, it is becoming increasingly clear that this need is far broader than the world we know at Shands. Many AYA palliative care patients, living with chronic and terminal diseases such as cancer and CF, frequently experience unmanaged negative physical, psychological, and social symptoms due to their illness, treatment, and lengthy and frequent hospital stays (Quittner, Alpern, & Blackwell, 2012; Quinn, Goncalves, Sehovic, Bowman, & Reed, 2015). Among AYA palliative care patients seen in Streetlight, there are four major disease populations: cystic fibrosis, sickle cell, transplant (most commonly heart), and cancer. Many individuals in these groups are at increased risk of infection in public spaces and as a result face environmental barriers in socializing with friends and family. 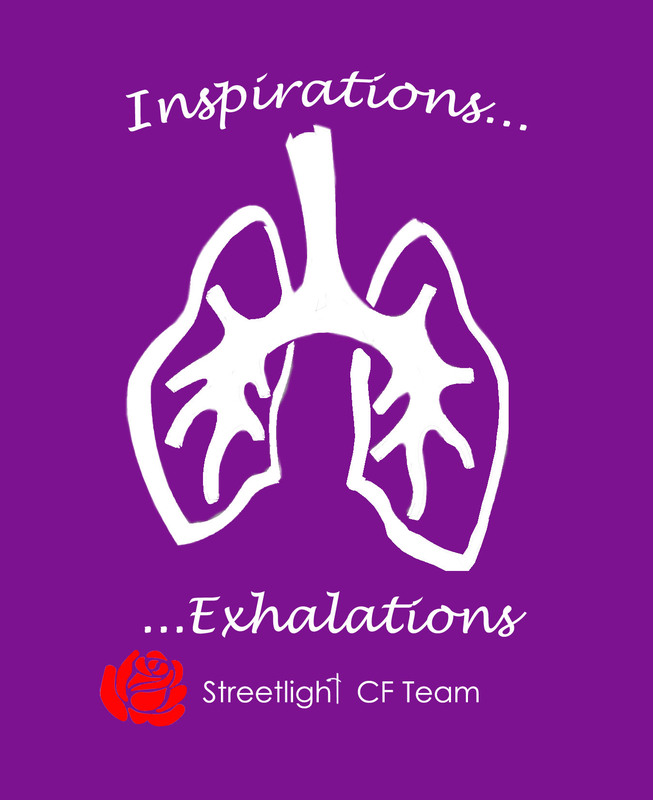 Cystic Fibrosis affects over 30,000 children in the United States, and while recent medical advances in treatment of the disease have led to increases in lifespan, CF still remains one of the most challenging chronic illnesses to manage (Quittner et al., 2012). Children and young adults with cystic fibrosis are typically hospitalized for “pulmonary exacerbations”, to combat the mucus build up in their lungs and digestive tracts, improve digestion, and fight infection (Quittner et al., 2012). Pediatric CF patients undergo hospitalizations for a median length of stay of 10 days, which increases by 2.5 days on average as patients transition into adulthood (Kopp, Wang, Chisholm, Kelleher, & McCoy, 2012). Despite advances in care, many hospitalized patients still have great difficulty managing symptoms of pain, sleep disturbance, anxiety, and depression, along with the social challenges of isolation borne by frequent hospitalizations and alienation from peers (Quittner et al., 2012). Previous research on peer relationships in patients with cystic fibrosis have indicated that relationships with other peers with cystic fibrosis were important for helping CF patients incorporate the meaning of their disease and symptoms into their personal identities (Radley, 1994). Unfortunately, recent developments in infection protocol, specifically surrounding the control of the spread of B. cepacia infections, for CF patients have caused many hospitals to implement strict in-room isolation infection protocol for CF patients to prevent transmission of this potentially fatal infection, which prevents CF patients from being able to form relationships with others with CF (Saiman et al., 2014). Sickle Cell Disease (SCD) is the most common genetic blood disorder, most commonly affecting nearly 1 out of every 375 African Americans (Edwards et al., 2005). Adolescents and young adults who live with SCD suffer from debilitating “pain crises” where sickle shaped blood causes blood clots to block oxygen flow to organs and tissues, resulting in excruciating pain that is difficult to treat (Ware, Montalembert, Tshilolo, & Abboud, 2017). Pain crises can be triggered by stress, changes in weather, diet, or a variety of other difficult to trace factors (Waters & Thomas, 1995). Pain crises can interrupt normal psychosocial development and create difficulties in maintaining peer relationships (Burlew, Telfair, Colangelo, & Wright, 2000). S Recent research on SCD adolescents and young adults has called for initiatives to offer SCD patients with the opportunity to meet and support other AYA patients with SCD as well as other chronic conditions, believing that such peer support networks could enhance many psychosocial factors and disease adjustment (Poku, Caress, & Kirk, 2018). During this year in the United States, it is estimated that over 7000 patients will be listed for a heart transplant, with nearly half of transplant patients waiting on the list for over a year (Stevenson, 2015). Heart transplant patients are listed as priority status, ranked dependent on how urgently they need a heart transplant (Stevenson, 2015). The highest status, 1A, is considered the most urgent, requiring “ongoing invasive hemodynamic monitoring and ongoing life support in hospitals” (Stevenson, 2015). Patients listed as high as 1A still commonly wait over 6 months before receiving their transplant (Stevenson, 2015). Young adult heart transplant patients have shown to have increased risk for depression, anxiety, and PTSD (Dew, Myaskovsky, Switzer,DiMartini, Schulberg, & Kormos, 2005). In heart transplant patients, social support is significantly linked to post-transplant survival and higher levels of psychosocial well-being (Spaderna, Mendell, Zahn, Wang, Kahn, Smits, & Weidner, 2010). Qualitative research on the experiences of young adult heart transplant recipients also indicated reported feelings of social isolation while in clinic, suggesting the benefit of online social networks to connect transplant patients with each other and provide social support through lengthy and uncertain admissions (Waldron, Malpus, Shearing, Sanchez, & Murray, 2017). Cancer is the fourth leading cause of death amongst 15-39 year-olds, with an estimated 70,000 adolescents and young adults being diagnosed each year in the United States (National Cancer Institute, 2015). Cancer patients face many challenges in physical and psychological symptom management as result of their disease and of their treatment, including pain, fatigue, nausea, social functioning, and difficulty establishing relationships (Quinn et al., 2015). Recent studies have suggested that a majority of adolescents and young adults with cancer have a desire to meet other same age peers with cancer, however a majority also report that this need is not being adequately met (Zebrack, 2009; Young, Dixon-Woods, & Zebrack-Isaacson, 2012). Isolation and alienation incurred by inpatient hospitalizations and immunocompromising chemotherapy sessions are often reported by AYA cancer patients (Newby et al., 2000). Has there been any research conducted on the Streetlight program? Yes. Research on program implementation, outcomes, and processes is a huge priority for our program. We want to make sure that our program is grounded in evidence-based methods, and that we are sure that our program is operating in the best possible way to support our patients. Check out a list of program research projects below for more information. Research is crucial to the understanding and sustainability of our program. The purpose of this study is to evaluate the social, psychological, spiritual, cultural, and phsyical wellbeing of patients who use the Streetlight Program at UF Health Shands Hospital, UF Health Shands Children’s Hospital, and/or UF Health Shands Cancer Hospital. We are currently in the process of collecting data. 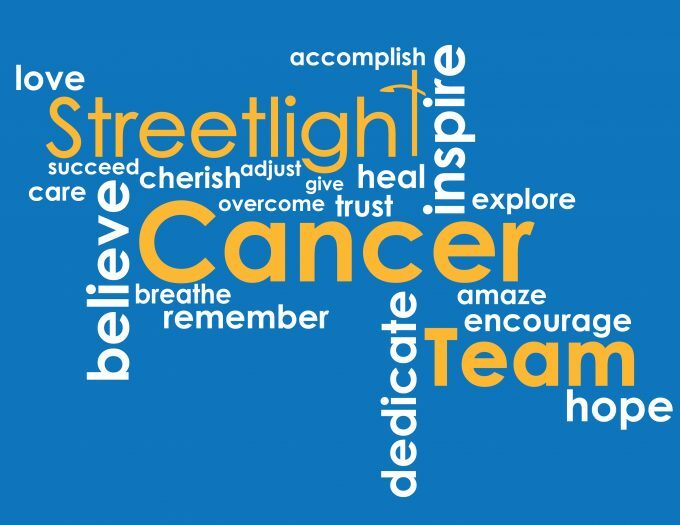 If you are a Streetlight patient who is interested in participating, or would like to know more, please contact Emily Sullivan, Streetlight Director at e.sullivan@peds.ufl.edu . 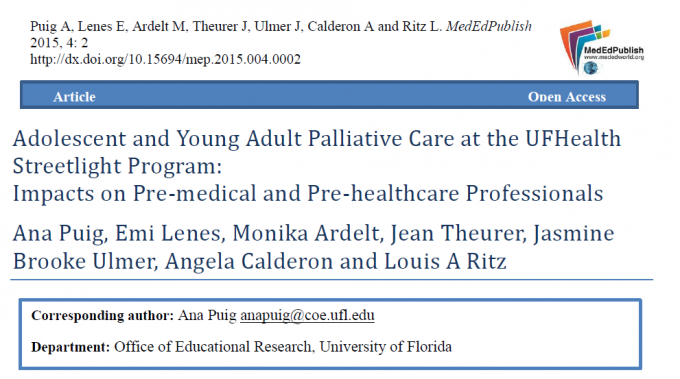 This study aimed to explore outcomes of an innovative palliative care program on 142 past and present pre-medical and pre-healthcare student volunteers. Results of the mixed-methods study indicate that the Streetlight program significantly impacted these student volunteers’ sense of empathy, and compassion. To learn more read our publication by clicking the image above. Thank you to all of the researchers and participants that made this publication possible. adaptation to sickle cell disease. Journal of Pediatric Psychology, 25, 287–299. years after heart transplantation. Psychological Medicine, 35(8), 1215-1227. Theory, Research, and Practice (4th ed.) (pp. 189-207). San Francisco, CA: Jossey-Bass. and adolescent cancer survivors. Psychooncology, 9:113– 12.
disease: An integrative narrative review of the literature. Challenges in the Adolescent with Cystic Fibrosis. Oxford, UK: Elsevier;. pp. 77–79. quality-of-life measure for cystic fibrosis. Chest, 128(4), 2347-2354. Radley, A. (1994). Making Sense of Illness: The Social Psychology of Health and Illness. D.J., (2014). Infection prevention and control guideline for cystic fibrosis: 2013 update. Infection Control & Hospital Epidemiology, 35(S1), S1-S67. Spaderna, H., Mendell, N. R., Zahn, D., Wang, Y., Kahn, J., Smits, J. M., & Weidner, G. (2010). new heart study”. The Journal of Heart and Lung Transplantation, 29(3), 247-254. American Medical Association Internal Medicine.;175(8):1406–1409. Ware, R. E., de Montalembert, M., Tshilolo, L., & Abboud, M. R. (2017). Sickle cell disease. Waters, J., & Thomas, V. (1995). Pain from sickle-cell crisis. Nursing times, 91(16), 29-31.
version). World Health Organization. http://www.who.int/iris/handle/10665/254813.